Products | EGA Products, Inc.
All-welded construction. 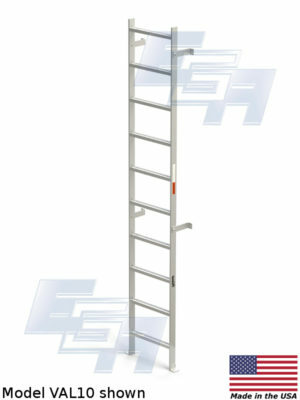 Ladders available in steel, aluminum or stainless steel. Single diamond grip-strut rungs. Rungs are 16″ wide spaced 12″ vertically. A great solution to navigate over low running pipes, electrical conduits or other permanent objects. 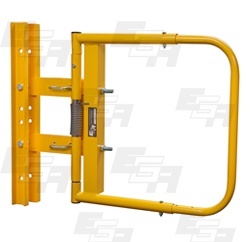 Swing gates, mezzanine swing gates, and industrial swing gates are an easy, inexpensive solution to enclosing handrail openings. Available in two sizes which are adjustable to fit almost any opening. Gate opens a full 90 degrees. EGA Mobile Work Platforms provide a secure workspace at a variety of heights. Each can be easily rolled from job to job on its dual 4" rear casters. Up to 800 lbs. capacity. Meets or exceeds OSHA standards. EGA Aluminum Mobile Work Platforms are weather and corrosion resistant while providing a secure workspace at a variety of heights. Each can be easily rolled from job to job on its dual 4" rear casters. Up to 300 lbs. capacity. 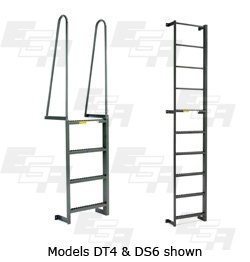 Improve time-and-motion around the workplace with EGA Crossover Ladders. They allow workers to transit above pipelines, conveyors, assembly lines, and other workplace obstacles quickly and easily. Up to 300 lbs. capacity. Improve efficiency by providing a mobile work surface that your workers can access from either side. 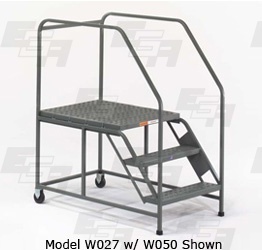 Each features 4" casters and our exclusive Ezy Lock® system, which plants ladder legs firmly to the floor when pressure is applied to the bottom. Up to 800 lbs. capacity. 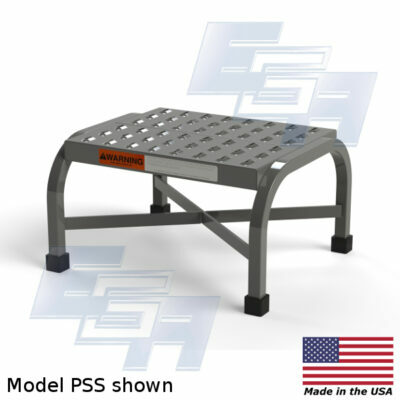 Access from both ends makes these platforms perfect for narrow aisles or congested areas, and the deeper platform provides greater workspace. Up to 300 lbs. capacity. 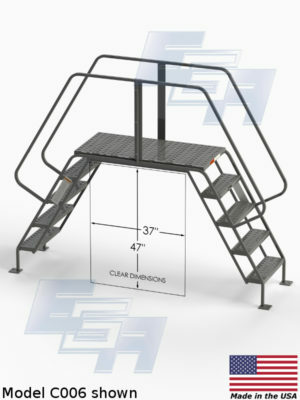 Provide easier access to docks, platforms, and mezzanines with EGA Walk-Thru and Side Step steel dock ladders. Each features all-welded construction for years of service in tough industrial environments. Up to 300 lbs capacity. Our 500 lbs. 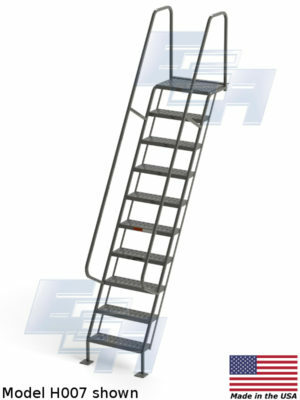 capacity dock ladder features all-welded 1 1/16" tube construction. Meets or exceeds OSHA standards. 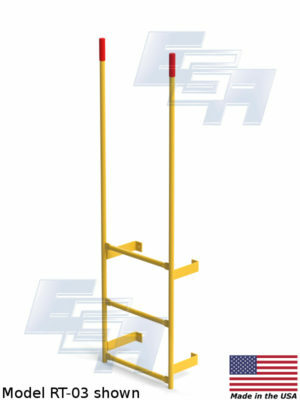 Sturdy 2-step wall-mount ladder is perfect for slippery or wet environments. Up to 300 lbs. capacity. Meets or exceeds OSHA requirements. 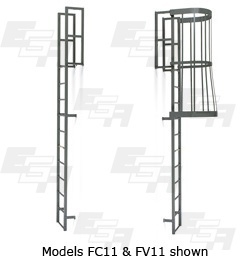 Designed to meet or exceed all known building codes, EGA Fixed Cage Ladders provide easy access to roofs and platforms. Up to 300 lbs capacity. Meets or exceeds OSHA standards. 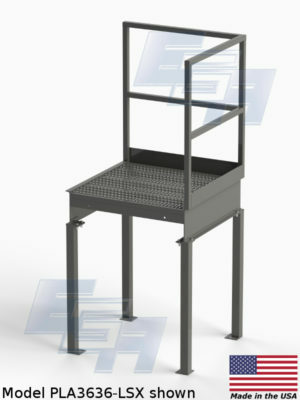 Stairway platforms from EGA Products offer a sturdy vantage point to inspect and access work from an elevated position. 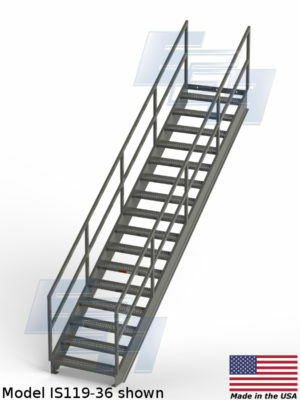 Create strong and reliable access to mezzanines and elevated platforms with EGA Industrial Stairways. Meets or exceeds OSHA standards. 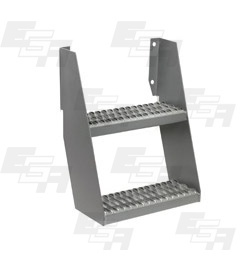 These exceptionally durable stepstools feature all-welded construction and cross-braced legs for extraordinary strength and durability in demanding industrial environments. Up to 350 lbs. capacity.